Microsoft has finally announced its Windows Home Server OS here in the UK. It's been nearly a year in coming, too, following on from a demo we first saw at this year's CES way back in January. "The Home Server product is specifically for the consumer market. This is really, I guess, the birth of a new product category," said Mike Haigh, Windows product manager in the UK. He was speaking at a briefing attended by Tech.co.uk. "Microsoft is working with people like HP to make sure the platform is broadly adopted." HP is on the market with two versions of its MediaSmart server - the £400 500GB EX470 and the £500 1TB EX475. Running on a 1.8GHz AMD Sempron processor, the box has four drive bays and four USB 2.0 ports for the connection of external storage. 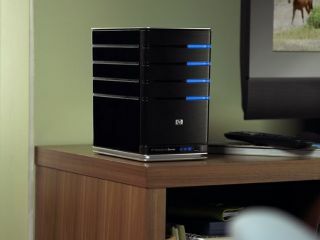 Windows Home Server has a slightly different sell than other Network Attached Storage (NAS) devices in that it's not pitched primarily as a backup device. Instead, Microsoft wants you to use Windows Home Server as the primary location to store your files. That way you can access documents remotely using remote access features as well as get to them from any of your PCs (or a Mac for that matter). The function on offer is excellent, but it's difficult to know whether people will buy it, especially given its premium price. Microsoft is pitching the Home Server at an enthusiast audience even though it admits that the box is designed to keep things simple. "The idea is that this becomes the hub and you don't need to have content on your Xbox or PC," adds Haigh. The MediaSmart has an embedded iTunes server that seems to be being somewhat underplayed, although spokespeople denied this at the briefing we attended. It isn't in the press release and it wasn't mentioned in the meeting until we talked about it. When asked for power consumption figures we were given some almost straight away, ranging from 52W in idle mode for a single drive unit (60W full load) to 76W in idle mode for a unit with four drives (99W full load). Compare that to an Xbox 360 that clocks in at just over 150W when it is on but idle. It will work with Time Machine on a Mac as it operates just like a network drive. And as for the remote functionality, we've seen a comprehensive demo of it and it seems extremely simple to use.